Well since you are busy I wont expect a response. That is pretty cool about the podium, the members are a very very important part of the work, especially in english. I am staying here another transfer. But we think something crazy is going down next transfer, like maybe a new area opening. So that one will be intense. Happy fathers day! I didn’t get to give a talk this time. I am going to send that present I promised Alex, and I am going to put some stuff in it for you. Don’t let him have it though till he writes me. I did get a package from Mrs Heidi. 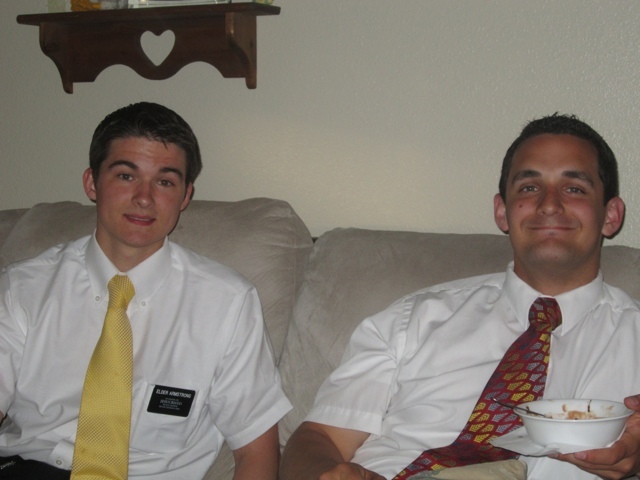 I am not going to wait to do the mission letter thing, I am just going to write my own. This week we did a lot of service for the branch president. We bucked hay for a couple of hours, in the raging heat, wearing flannel. That was fun. I have pictures. We also helped set up a party at the church farm here. We handled some attractions and the sign in desk. Elder Erekson and I worked the sign in and ticket dispensing because there were a lot of Latinos. We only had like 4 lessons this week. So when we weren’t doing service, we trackted. We found a bit of potential doing that. We will find out for sure this week. I went with the district leader on exchanges Wednesday in the blazing heat. I met some pretty interesting people. We talked to one guy sitting under a tree. He wasn’t too interested, but he thought I looked familiar. After riding away, we both deducted that he was selling drugs. But anyway, even though we didn’t even meet with Hugo and Nayeli, and only had 4 lessons, we feel like we had a successfull week because of trackting. Well monday we played some hard basketball. I drank 2 whole pitchers of water. The lesson canceled for that night. Tuesday after the chiropractor, we were suppose to eat lunch with Aaron Rogers’ dad, but he didn’t answer the phone. That day we drove around some neighborhoods north of us looking for some latino houses. We couldn’t find any. The big lesson also canceled that night. Wednesday we had a fun district meeting and practiced a new door approach. We still haven’t had the chance to use it. That night we had 3 lessons set up, and 2 canceled. Ironically, they were both related to each other. The one that we had was pretty good. 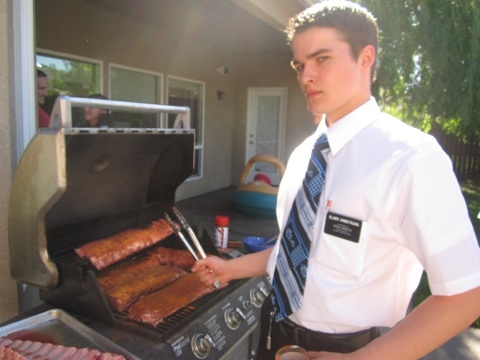 Thursday an Elder received his birthday present from Texas… a full brisket. So that morning we had at least a pound of brisket each. Then we had to sit in a hot trailer for a lesson and try not to fall asleep. Then the same person that has canceled 2 times canceled again. Saturday we had breakfast at an english ward activity, then went to a baptism afterwards expecting our investigators to show up. They didn’t. English class was fun though, we taught body parts. Church was really nice Sunday. The talks were nice, the branch president taught a fun Sunday school lesson about presidents of America, and a recently re-fellow shipped member gave the lesson priesthood. Hes a cool guy. Then we had dinner with presidents family and played some card games. As we parked the car at the next lessons house, she drove away. She turned around and told us we would have to reschedule for the next week. Today we hiked monkey face again, that trail that I have already sent pictures from, and played basketball. This week was a little better than last. We taught a lesson to Hugo and Nayeli that we haven’t taught before. It was about the importance of teaching and learning. But that was Tuesday and we haven’t taught them since. We did see them and their brother at a farmers market. Speaking of which. One day at the farmers market we saw: Hugo and Nayeli with his brother, and set up a time to see him, we saw the brother of another investigator and set something up with him, and spent time with a guy from Moldova. 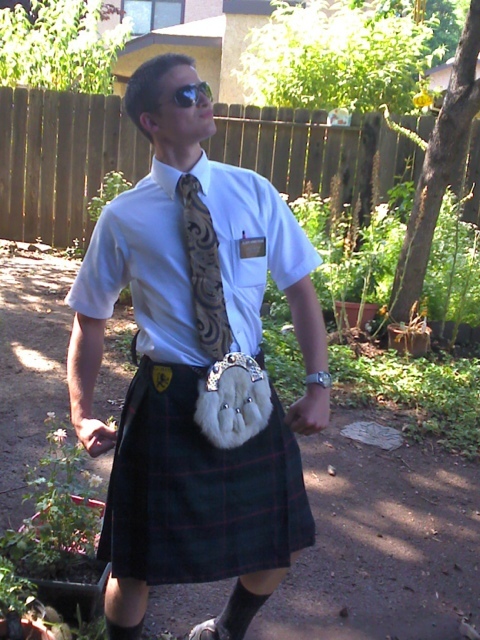 That day I also got my kilt. Friday we helped move Dr. Rogers to his new Chiropractic office. He is Aaron Rodgers’ dad, the pro footballer. That was fun, we are going to have lunch with him Tuesday. We had exchanges with the other Spanish elders Saturday. We tracted a good bit(they are always surprised when two white guys show up and speak Spanish), and explored an area up north that hadn’t been worked through by Spanish before. But there were no Spanish people. Then after English class, we did service for a less active, sanding drywall. It was a mess but we ate pizza. Well this week has been LONG. It has been really slow. Lots of lessons have canceled and no one returns calls. I have also been sick for a few days. My neck and back got to the point where I lost my appetite. Plus, I also got some sinus or allergy problems. But during that/this time, I have been able to just focus more on the work. It is kinda cool. Like normal when you are sick, you don’t want to do anything, even normally fun stuff. 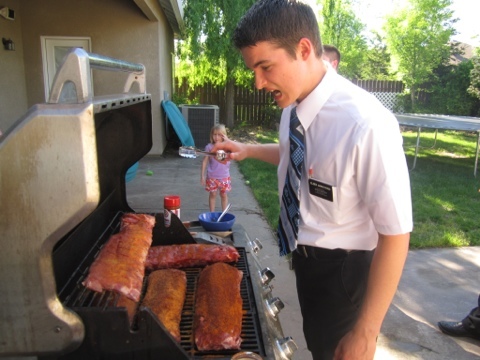 But since missionary work is above all that, you still have the desire to do it. So I have just been practicing lessons, thinking about finding activities, and reviewing Spanish constantly. We only had 3 lessons. Hugo y Nayeli canceled like 3 times. We haven’t seen them in over a week. Wednesday we had zone conference from 9 to 3. That was pretty cool. Lots of learning and motivation. We are now designated like an hour a week outside of Pday to work on mormon.org. Im trying to finish my profile. Today we are going to eat dinner at the fair and watch the demolition derby. Tuesday we had exchanges. 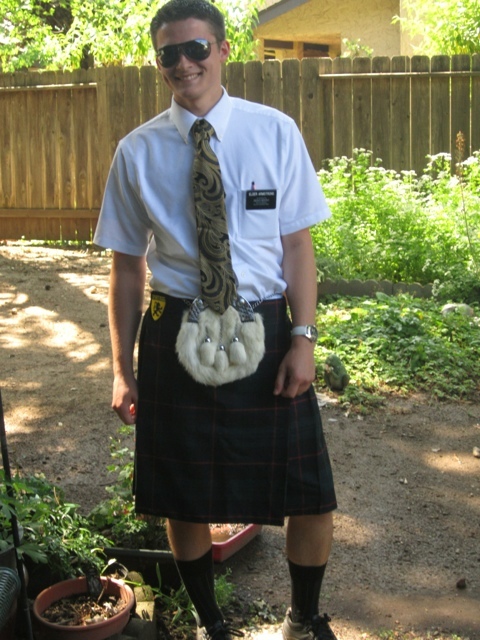 I wanted Elder Schnitzius to come with me because he understands a little bit of Spanish. So….I got to drive for that day. It was pretty fun. I definitely drive better than both of my companions so far. But that day had a rough start, even though we ended with teaching four lessons and contacting two people. All district meetings are good, but this one actually made me take notes. While eating at Hardee’s with a member, we talked to a guy who had been visited by missionaries in Chile. Now he’s here and doesn’t care too much about religion. But we got his address and such. That was pretty interesting. A few more lessons canceled this week. Both English classes canceled. One because they couldn’t come, the other because a family in the branch had their 25th wedding anniversary. Plus, Ritchie went down to Yuba city to baptize someone while I stayed at the party. Sunday we had PEC for awhile then couldn’t set up any lessons the rest of the day.